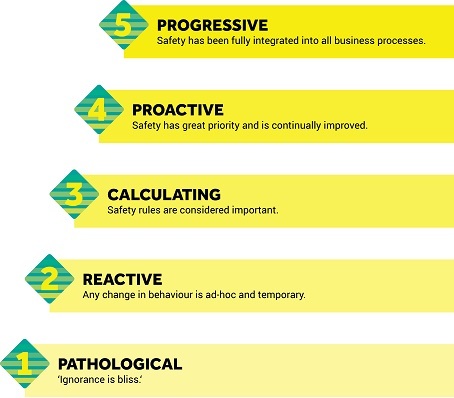 The Safety Culture Ladder recognizes five steps. The Safety Culture Ladder recognizes five steps. The ladder steps indicates the level of development in which a company operates in the field of safety awareness. The company’s attitude is: ‘we have no mishaps, we deliver good quality, so why should we waste time on preventive activities’ and ‘what you don’t know won’t harm you’. The company makes little to no investment in improving safety behaviour. This is not the desired attitude and will therefore not be rewarded. The company tends to make changes after things have gone wrong. The response is based on deeply ingrained patterns. Employees are inclined to feel themselves the victim of a situation, rather than personally responsible. ‘But that is not my fault?’ Change behaviour is often ad hoc and short lasting. This behaviour is moderately valued. The company has determined which safety rules are important. It adopts a vulnerable approach, assumes responsibility, but is often driven by self-interest. ‘What’s in it for me?’ Involvement in safety and compliance with rules and laws is mainly the task of (senior) management. Attention is given to health and safety, which is valued. Safety has a high priority, is deeply ingrained in the company’s operations. Continuous investments are made in raising safety awareness and employees are encouraged to confront one another with unsafe behaviour. Improvements are structurally implemented and evaluated. The approach is characterised by proactivity and initiative. Safety awareness is regarded as an own responsibility: ‘how can I contribute?’. This form of behaviour is highly valued. Safety is fully integrated in the operational processes. It is a fixed item on the agenda during reflection and evaluation within the own organisation and with sector parties. Safety is ingrained in the thinking and behaviour of all employees; it is part and parcel of their work. This is very highly valued.